Blade length : 81.27 cm or 32 inches. Sori : 3.63 cm or 1.42 inches. Width at the Kissaki : 2.29 cm or 0.9 inches. Era : Late Nanbokucho period to early Muromachi period. Shape : It is slight machiokuri(tang cut shorten) blade however most of the tang is ubu(original). It is long katana with deep sori(carve). Jitetsu : Itame hada well grained with mokume(wood pattern) mixed. There are some clear hada. There is some loose kite parts but it is not serious. Hamon : NIe base suguha with mokume(wood pattern) mixed. The ha becomes nijyuuba(double ha) and koashi is seen. There is shirake utsuri(foggy part) seen. Special feature : In Mutsu country, there is Maikusa school which is said to be the origin of Hojyu. left therefore there are accurate appraisals even those with no signature. 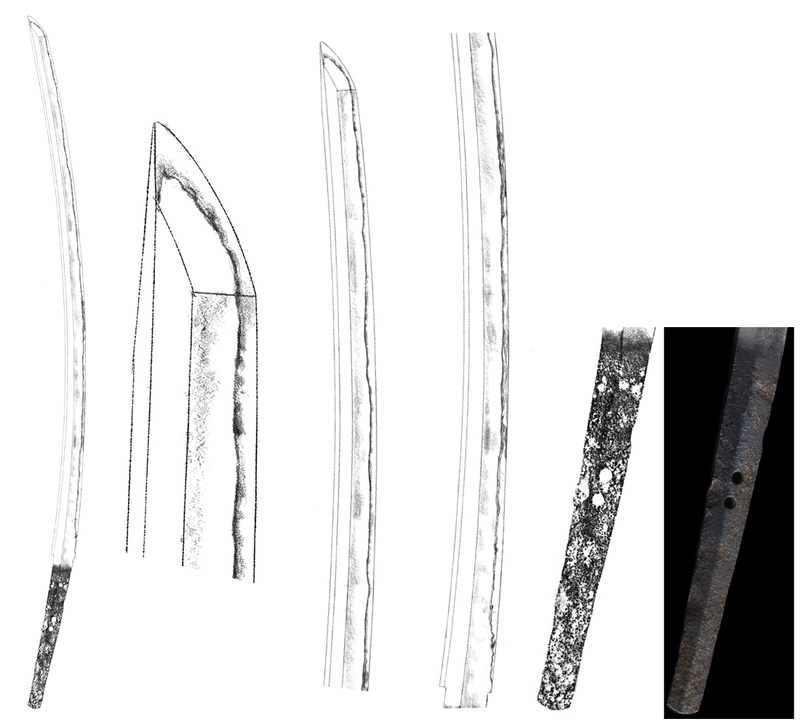 It is interesting that the imitated piece of Kyushu swords has similar characteristic of Konaminohira, Sairen, Jitsuya pieces. As far as we can predict, the sword smith from Kyushu has moved to Tohoku and has made the sword from the jigane there. 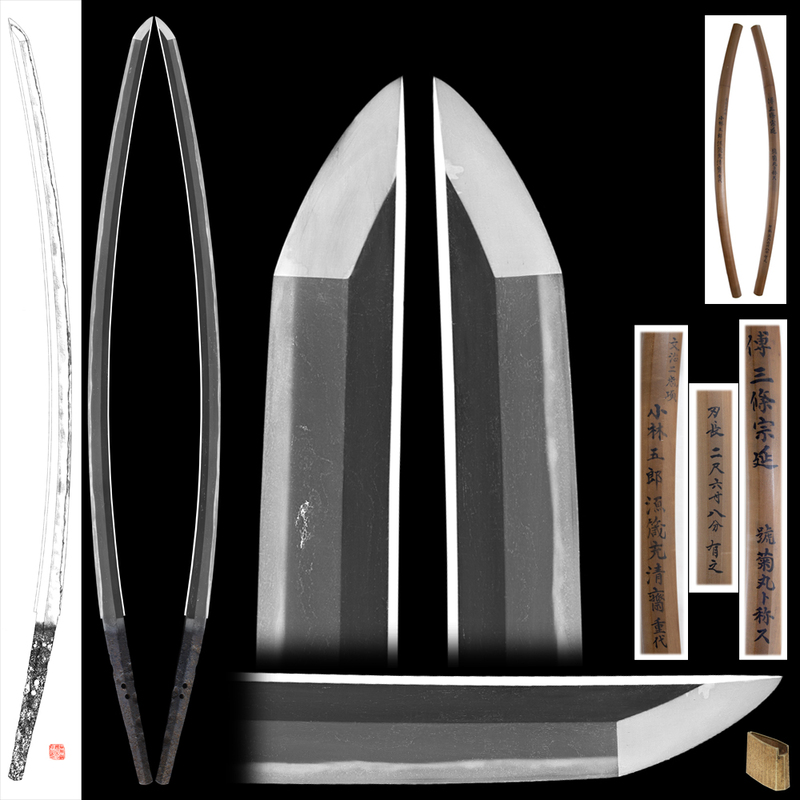 This may be the reason that those pieces are similar to Kyushu swords. Boushi is thin and mixed end it is sharp end. This pièce is similar to the signed Jyuyo piece and reveals antique　feeling. The nakago is ubu nakago(original nakago). It is wide and thick blade impressive piece. There are some minor kizu seen but that is one of the characteristic of Hojyu and Maikusa. Boushi is Historical background:Genkou no rant 1331.